Our flat-packed recycling waste bins are easy to assemble. Made of strong recycled board, and perfect rubbish/recycling bins for various environments and events. Delivered in packs of five. 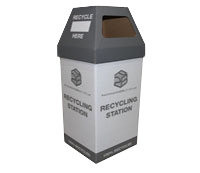 Our smart sturdy cardboard recycling bins are ideal for offices, factories, canteens etc. Can be customised. The bins can be reused or recycled. Our recycle bins are ideal for recycling & collecting trash at weddings & private & public events. They are economic, space saving & can be recycled. Our clear plastic sacks are gussetted to give extra capacity. Available in 120 gauge 50/pack, the clear plastic sacks are ideal for recycling schemes. Items for sale on this website are stock items, unless a lead time is shown. Stock items should, in normal circumstances always be in stock and available for despatch as soon as payment is received in full. The cut off time for which orders will be processed is 2.00pm. If you place an order before this time it will be processed and despatched the same day (subject to stock availability). Orders received after 2.00pm will be processed the following working day. Next day delivery on items showing a lead time will be delivered on a next day delivery basis as soon as these goods are received in stock. Unfortunately, we are unable to process orders at weekends or on bank holidays at this time. Orders placed during these times will be processed on the first working day back. We always do our best to maintain high stock levels by receiving regular deliveries from our suppliers. Whilst it is our policy to avoid shortages in stock, this, on occasions cannot be avoided. Should an item not be available for delivery within the time you specify, we will contact you to advise you of the delay. If you have any other requirements, please contact us by emailing help@packaging2buy.co.uk and we will do what we can to help. If, for any reason, there is any defect in the quality, quantity or condition of the goods we will give you an exchange or refund. Please notify us by email on help@packaging2buy.co.uk or by telephone on 01707 635353 quoting our order reference within 7 days of delivery. As per the Distance Selling Regulations, you have the right to cancel your order within 7 days of receipt of goods, with the exception of Custom Made items. You must notify us in writing of the cancellation and return the goods in the condition they were delivered to you at your cost and at your risk. Please note: You have a duty of care while the goods are in your possession, and they are your responsibility until the goods have been received on these premises. For further details, please refer to our Terms and Conditions of sale.